Glenn Hubbard is dean of the Columbia University Graduate School of Business and coauthor of "Seeds of Destruction: Why the Path to Ruin Runs Through Washington, and How to Reclaim American Prosperity". From 2001 to 2003, Hubbard served as President George W. Bush's first chairman of the Council of Economic Advisers. During that time, he was instrumental in designing the Bush tax cuts. I called him to ask what he thought of their limited extension, and the deal Republicans cut to secure it. Economist Glenn Hubbard reacts to a week of mixed market signals: higher jobless claims, Ireland’s debt concerns, a stock rally and positive retail sales. 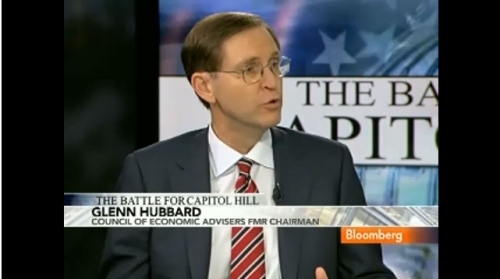 Economist and Republican Glenn Hubbard was the chief architect of the Bush tax cuts now at the heart of debate in Washington. conomist and Democrat Alice Rivlin was at the heart of Clinton-era economic policy, when the U.S. budget was put on a path to surplus. Now, they’re both talking about looming crisis for the U.S. economy, and finding common ground to save the U.S. economy. Is there enough common ground there? Enough to avoid gridlock, find a course, and get our act together? Glenn Hubbard, dean of the Columbia Business School and member of the Bush administration's economic team, and Peter Navarro, CNBC contributor and business professor at UC Irvine, discuss their new book Seeds of Destruction: Why the Path to Economic Ruin Runs Through Washington, and How to Reclaim American Prosperity, in which they offer their views on saving the economy. Glenn Hubbard, Robert Altman, Meredith Whitney and Glenn Hutchins talk about the U.S. midterm elections. They speak with Charlie Rose and Bloomberg's Al Hunt. Glenn Hubbard and Laura Tyson, former chairmen of the Council of Economic Advisors under U.S. Presidents George W. Bush and Bill Clinton respectively, debate the way forward for the world economies. CNN – Are Tax Cuts for Everybody a Good Idea? The rich are getting richer, the poor and middle class slipping. So are tax cuts for everybody a good idea? We have one of the key architects of the original Bush tax cuts here. We're going to ask him whether tax cuts for all of you should be extended, next. Read the transcript "Are Tax Cuts for Everybody a Good Idea? "CNN – Are Tax Cuts for Everybody a Good Idea? Is the Economy at a Tipping Point?